TBA: Alpine info meeting, 6-8pm, Bozeman Public Library. 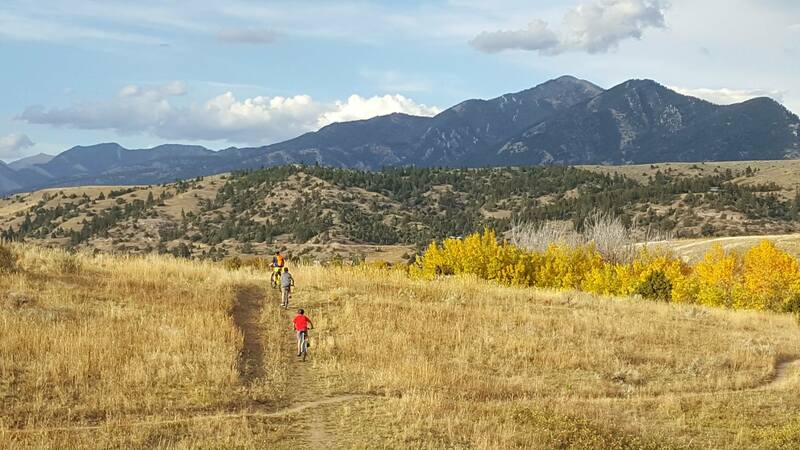 Mountain biking during fall dryland training. The Development Competitive (Devo Comp) program is for athletes progressing with their alpine skiing and transitioning to a more comprehensive training and racing schedule. This program also offers fall training (outdoor play and strength), which helps prevent injuries and builds a fitness base. On-snow practice, which begins as soon as resorts are open (early December), combines free skiing, drills, and gates. Technique (how to ski) and tactics (where to ski) are taught in tandem. Coaches will present a general training plan for the group and customize some aspects to meet individual needs. We maintain a balance between having fun, building a positive team environment, and advancing our skiing. We want you to love skiing as much as we do. Local schools have been very accommodating to early dismissals for mid-week afternoon on-snow sessions and conditioning as long as the athlete is in good academic standing. 5 days per week: Monday, Tuesday, Wednesday, Thursday (pickup at 1 pm., returned to BSF office at 3:45 p.m.) Locations vary. Competitions primarily take place throughout the Northern Division (Montana and Terry Peak, S.D.) Competitions are scheduled under U.S. Skiing and Snowboard. How much you travel and/or race is up to you and is best discussed with your coach. Local transportation (for training). Varies and seating can be limited. Talk to a coach. As a member of the Devo Comp Team, you're eligible to apply for need- and merit-based scholarships. Learn more HERE. We know—purchasing equipment is daunting and often expensive. BSF is here to help you through the process and find the best gear for your athlete. There are lots of resources. Please contact us with any questions. Athletes involved in U14 training/racing are at an age when their bodies are constantly changing. While it is important in skiing to have quality equipment, young athletes DO NOT necessarily need top-of the-line “race” equipment. All of the top manufacturers make quality gear with a wide range of prices and applications. The Alpine Team holds an intra-club gear swap each October (before the big BSF Ski Swap at the Fairgrounds). This is a great time to source (and sell) used equipment among fellow teammates. Local retailers or online. (Your BSF membership gets you discounts at several local shops.) Also, keep your eyes out for the team BSF emails—occasionally retailers will sponsor team nights with discounts. Most athletes will need free skis, Giant Slalom (GS), and Slalom (SL) skis. Those interested and prepared for speed can consider Super G skis or longer GS skis for speed events. At this age and skiing level, more and more factors come into play when choosing equipment. Height, weight, and ability/skill are key ingredients in making equipment decisions. You should check with your coaches for ski length recommendations and adherence to FIS and USSA rules. The introduction of skis with more side cut has been a major breakthrough and can take a year off an athlete’s learning curve so we strongly recommend that you buy a newer side-cut ski. There are some rule changes regarding side-cut and lengths for the “older” skiers racing at high-level competitions. Your coaches will be well informed of any changes and help athletes accordingly. The U14 age is a great age to develop tuning skills. All mountain/powder skis are fine in addition to race skis. However, they should be skied on specifically for all/mountain and powder conditions. An important note on fat skis: Over the past few years, FAT skis have become very popular. While this is innovative technology and a fun component to skiing, it can be counterproductive to racing fundamentals and technique. We encourage Alpine athletes to use FAT skis for powder days or very occasional free skiing. Research has proven that the use of FAT skis requires very different technique than what is used to ski traditional “race” skis. No training on FAT skis or using FAT skis as free skis in between race runs on race days. It is much better to have an older pair of race skis as trainers and inspections skis. Some people say that the three most important things when it comes to ski equipment are boots, boots and boots. Many parents try to buy boots “a little big” so that a child’s growing shoe size can be accommodated for more than one season. This is theory will typically result in a challenging venture for the developing athlete. A proper fit is key because boots are your connection to the snow. A proper fitting boot gives you feedback, lets you know what your skis are doing, and helps the athlete determine what they want their skis to do. A sloppy fitting boot equates to sloppy or less precise skiing and can encourage bad skiing technique. Steer away from rear-entry boots as they can cause children (and adults) to lean back too far. Adult boot construction is typically very different than junior boot construction. Adult boots are generally stiffer and taller. Junior boots are great for skiing/racing development and athletes should utilize junior boots sizing as long as is appropriate. They have many of the features of adult boots but have a softer flex to facilitate better body position and movement when skiing. A quick way to find the proper boot size is by “shell fitting.” Take the liner out of the boot. Put the child's (socked) foot into the shell. Have them move their toes forward till they hit the front of the boot. Toes should touch without scrunching! Have them bend their knee forward. You should be able to fit a finger between their heel and the back of the shell. One finger is a “race fit.”It may be tempting to go a bit larger for growth but keep in mind that boots are the link between the pilot and the snow. An approved helmet will have the FIS sticker. Helmets should fit snug and provide good visibility. Be sure your goggles fit in them. Make sure the back of the helmet is not rubbing on your neck or the front of the helmet is not pushing your goggles over your nose. Head, arm, hand, shoulder, back, teeth (mouthguard), and shin protection recommended, based on event. GS-standard length, SL-pole guards for blocking and protection (pole may be slightly shorter). To size poles, turn the pole upside down and grab it under the basket. Your elbow should be bent to or just past 90 degrees. Take into consideration binding and boot height. Grips should have straps. In sizing poles, longer is better (they can be cut if too long). They are great for getting out of a start and will remind you to keep your hands up. Select clothing that will meet your child’s need for health, safety, comfort, and function. Layering is a good way to ensure proper warmth. Layers can be added or removed as outside and body temperatures fluctuate. Gloves, helmets, and goggles deserve special consideration, as the extremities get cold very fast. On cold days, neck warmers are a great way to keep drafts out and protect the face from frostbite. An extra pair of goggles on powder days is a smart idea. Racers are not allowed to run gates without helmets and goggles! Team coats are available: your coach will be in touch about orders. Given the terrain and requirements for certain areas at Bridger Bowl, rescue beacon and confidence in its use is recommended. When you register for the program, you will be added to an email list. Your coaches will communicate weekly details to you through email, as well as any last-minute changes. (It’s important that you do not unsubscribe to BSF emails, as this is our main mode of communication in the winter.) If for some reason, you are not receiving emails from us, let us know! Races: Parent/volunteer assistance with races is needed and is a fun place for parents to learn about ski racing. No experience necessary. Look for info in emails. There’s a bigger picture to what BSF teaches skiers, when and why. BSF’s programs are consistent with the U.S. Ski & Snowboard Alpine Training System. 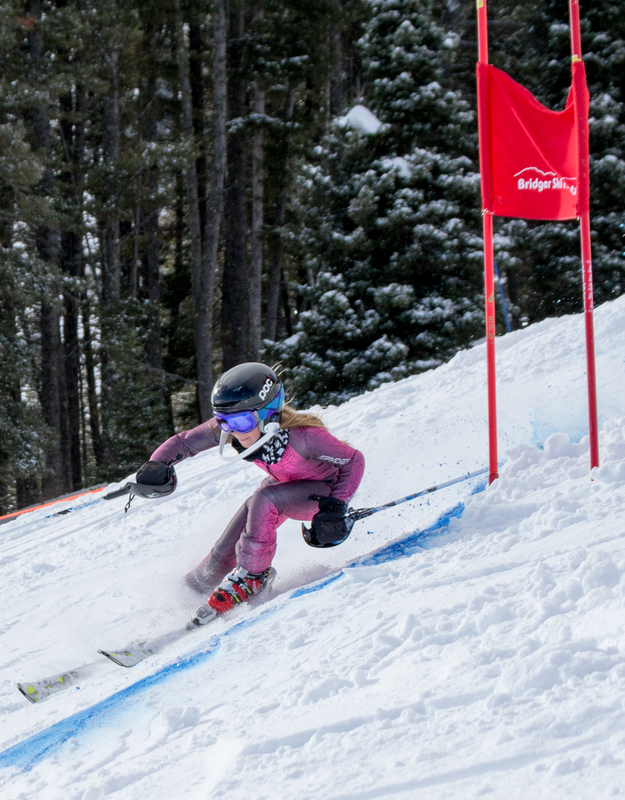 This makes it easy for your child to progress through our programs—from Introductory, to the Development Teams, to the competitive teams, and even on to skiing as an adult Masters athlete. The BSF Alpine LTAD follows the guidelines of the USSA LTAD. Sport Participation: How many days skiing/year, # of competitions, and train/comp ratios. Conditioning: volume and content for physical training outside of skiing. Technique and tactics: specific skills for the sport. Equipment selection and preparation: the essential equipment needs for competition. Conditioning: appropriate type and level of competition. In the U14 (12-13 year old) age group, growth and physical maturity play a large role in athlete development. This will be a general guideline with some individual planning necessary in some cases. U14's have often had a few years in the sport of skiing. Many will ski 3 days a week, logging 70+ days a season. Free skiing versus training percentages will get closer to 50%, and competition season will become longer with the potential for post-season regional racing. U14's can expect 10-15 race starts a season. With increased physical development, the need for "in-season" conditioning/recovery sessions becomes more important. With training schedules and studies, these conditioning sessions can be difficult to schedule. The athlete will often need to find some personal time that works best for fitness maintenance. Coaches will give recommendations of workouts that can be performed individually. Playing complimentary sports, when possible, is helpful. Increased aerobic conditioning and balance/agility/coordination is key. Body weight exercises will help develop strength, and older athletes can start with light external resistance (bands, medicine balls, etc.). Reinforcement of carving skills while learning line and strategy. Emphasize the use of tactics to achieve carved turns in the most appropriate line for the athlete. Always work on the very basic fundamental drills to insure mastery. Develop speed and efficiency by refining carving and steering movements to achieve the desired turn radius in courses. Use a variety of course sets, conditions, and terrain to teach the skier to adapt to different situations. Free ski all conditions with competence. U14's may still be in their "sampling" years but are moving more towards a strong commitment to the sport. Positive self-talk, work ethic, perseverance, and goal setting while still maintaining a focus on the process over results. Continue to use imagery and visualize good technique. Teamwork and Sportsmanship are integral. Positive parental support and club/program involvement is important. Divisional racing leads to the Divisional Championship which may lead to Regional events (Tri-Divisionals, etc.). At the Divisional level, every effort should be made to create a race schedule with training weekends between race weekends. This is not always possible and coaches will use discretion to help the athlete find the optimal balance between race starts and training (fundamental skill mastery). Skiers in this phase are starting to grow into their new bodies after the growth spurt, with the benefit of increased stamina. Strength gains can be quite rapid in this phase, and skiers can be expected to generate more power through their turns throughout the course. The anaerobic system starts to become developed, allowing skiers to ski with greater intensity from start to finish. This will be a general guideline with some individual planning necessary in some cases. U16-U18's have often had 6-11 years in the sport. Many will ski 4-5 days/week logging 100+ days a season. At least 15% Free skiing. Competition season often goes Nov-April. Potential for post-season regional racing. U16's can expect 18-20 race starts a season (max of 25). U18's can max at 45 if they are at a regional/international level). At this age athletes should begin to specialize in their sport, note athletes are encouraged to play one complementary sport to support their skiing skills . With increased physical development, 2-3 "in-season" conditioning/recovery sessions becomes more important. With training schedules and studies, these conditioning sessions can be difficult to schedule. The athlete will often need to find some personal time that works best for fitness maintenance. Coaches will give recommendations of workouts that can be performed individually. Playing complimentary sports (Ice Hockey in the winter) when possible, is helpful. Increased aerobic conditioning and balance/agility/coordination is key. Resistance training will help develop strength. Older athletes should be utilizing Olympic lifts for power. Refinement and event specific stage for technique and tactics. Integrate the increased strength, power and body size to achieve a more optimal line. Incorporate jumps, terrain, traverse and long turns into training. Advanced tactics for difficult situations (a-rhythmical course sets, difficult conditions and terrain). Commitment. Develop and refine race day plan. Develop mental rehearsal routines. Refine goal setting process- what to focus on, what works on race day, develop “ athletic plan” to approach training sessions and life. Document through journaling. Parents continue to support the commitment of the athlete in the sport. Appropriate level and number of race starts ranging from local to national and international competition. Expect a ratio of 1:4 (race:training).